An ariel view of Newgrange, a prehistoric monument in County Meath. It was built about 3200 BC, which makes it older than Stonehenge and the Egyptian pyramids. Spending time in nature’s sacred places can bring balance to the whole self and help you reach your optimal level of health. It is possible by listening to the symptoms, observing the signs, and undertaking a thorough clinical examination to determine any physical pathology. Mental and emotional health can generally be assessed through careful history taking and the patient’s own narrative. The fourth quarter of the circle is harder to assess and it is easy to understand why. Many people today equate the spiritual with religion and thus it is not seen as relevant to a health consultation. However, man’s spiritual awareness predates religion, which may even be considered man’s attempt to describe and conceptualize his experience of the numinous in creation. The spiritual is best described as the awareness of the divine in one’s surroundings, an awareness of the transcendent in the here and now of our environment. The success of John O’Donohue’s book Anam Cara bears testimony to the awareness of, and desire for, this experience in our surroundings. This experience of the spiritual and divine in nature is experienced through the other three quadrants in the circle of life. It is through our physical and emotional senses that we open ourselves to this experience, and acknowledgement and integration of this gift is achieved through our mental faculties. Celtic spirituality has always been associated with nature. Nature nourishes us and the annual cycle of feasts and festivals in the Irish calendar advises us of this truth. These seasons follow the length of the day, with each day beginning at sunset. This reminds us that all nourishment and healing takes place in the dark, unknown to us. The seed begins its growth in the dark of the earth long before the first leaf appears overhead. Likewise, the Celtic year commences in winter, on November 1st, the feast of Samhain, a time when the veil between worlds is lifted and it is easier to communicate with those who have passed from this life. This awareness of the nearness of the ‘other world’ is part of the psychological makeup of many Irish people and it is necessary to be aware of its utter normality for many people when touching on matters relating to grief and bereavement in the clinical setting. The first day of spring is still marked in many Irish households by placing a St. Bridgid’s cross on the door. The young pliable green rushes are bent and twisted into the familiar cross shape, but their very freshness captures the rising sap and the commencement of the new farming season. This rhythm of life and the balance inherent in the recurring journey of the sun is captured in the Celtic cross. The horizontal shaft spreads out to the ends of the earth, and the vertical from the depths of the underworld to the vault of heaven. These two shafts are intersected by the circle symbolizing the annual cycle of the seasons, which in turn encloses the four quadrants of life. Cailleach, a fascinating figure, was an ancient goddess who shaped the land through her control of nature. 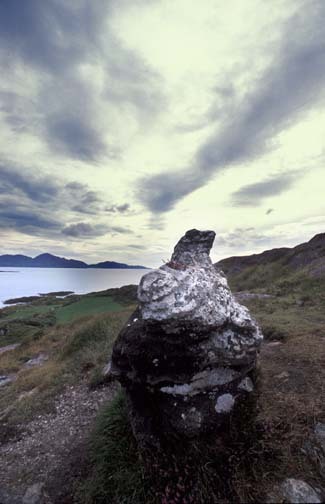 She is especially associated with the Beara penninsula and there is a rock there known as the ‘Hag of Beara’. The forces of Christianity turned her into a rock, according to legend. She was a princess of the Kallaikoi and married Owen Mor, the King of Munster. Owen was killed by Conn of the hundred battles who lived in the 2nd century AD. The first time Cailleach is mentioned in writing is in the classical work Histories, written in the 5th century B.C. by the Greek Historian Heredotus. He mentions a Celtic tribe on the Iberian peninsula of Spain called the Kallaikoi. She and Owen were also written about by the Greek Geographer Strabo, and Pliny writes about them in his Natural History (77 A.D.). – She shapes the land. – She can shape-shift – maiden, heron rock etc. – She was respected in early Christiantity but later demonized. There are wells for taking away warts and wells for healing sore eyes and there is also the famous well, in Gleann na Gealt in Kerry, which helps cure depression. It does not matter that we now know that the water in this well contains high levels of lithium, so it is a natural anti- depressant. It is far more important to know that our forebears went there in times of travail so that they might experience the healing hand of nature. This trusting in the beneficence of nature continues – even today, many of my patients will go to a well to heal certain ailments. According to cultural geography, therapeutic landscapes are those places or settings that foster healing through their physical and psychological impact. They do not always have to be in nature, but here in Ireland most of them are. It is impossible to visit Newgrange during the winter solstice, and watch the sliver of light enter the chamber, gradually filling it, and not be in awe of the people who designed and built it. This goes for any stone circle with their careful alignment of stones so as to mark the depths of winter, the equinoxes or the high point of summer. Modern bio-medicine is ordered, organized, and coherent to its practitioners. It is born of a particular cultural context and it gains significance and power from this. The patient is, for the most part, a passive recipient of the information and the proposed therapy. The illness is defined and classified, the therapy is proposed, and the whole experience is expected to follow along certain lines with no deviation. The expectation is, that the patient will be compliant and no departure from the defined path followed. It can be seen in this scenario that two of the four quadrants are neglected. These are the emotional and the spiritual. Yet these are as important to our health as the physical. Ascertaining the sacred landscapes and symbolism that are important to a patient means that it is easier to integrate a healing therapy into their whole being. Places of peace and renewal can allow patients to channel their vital energy to the task of healing, but it is the job of the physician to identify and help the patient in this direction. It is this area of medical training that is sadly lacking and it is not only the patient who suffers by it. The modern health care professional is trained to be stringently scientific and there is no shortage of blood work, scans and tests undertaken to find an answer and offer a solution. This very training leaves the physician yearning for something more, something that allows him to offer that very elusive gift called healing as distinct from curing. The modern health care professional would therefore serve themselves, and their patients well, by applying some of the same rigor to the spiritual and emotional states of their patients. This would result in a more rounded and holistic care that would bring fulfilment to both the health care provider and the patient. Rosari Kingston is the director of the Irish College of Traditional and Integrative Medicine, which offers 10-day intensives in traditional Irish healing that include visits to sacred sites and allows participants to spend time in clinics of traditional medicine. In this way the participants gain insight not only for themselves but also knowledge of how to help integrate the four quadrants involved in health and well-being.